Outreach and Education is a mandated element of the Marine Life Protection Act (MLPA) and requires the creation of provisions for educating the public about MPAs to be included in the MPA Management Program. The majority of the Leadership Team members have established outreach and education programs. 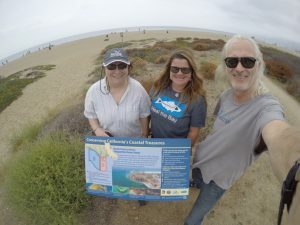 These programs have been used extensively by some members, like the California Department of Fish and Wildlife, to directly address the significant needs in this area. Priorities identified in the MPA Statewide Leadership Work Plan designate tasks to members that improve the state’s efforts in this area by leveraging existing programs to expand their work to include the MPA network messaging within existing programs. Members of the Los Angeles Collaborative show off their newly installed MPA informational sign. Photo courtesy of Paul Hobi.